Make your visit to the COEX InterContinental Seoul a memorable one. Until December 30 a brand new SM7 (3.5RE) sedan will be on display in the hotel's lobby. 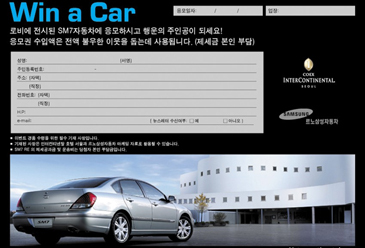 All visitors are welcome to submit an entry form to win this automobile. At the same time a collection box has been set up to take donations and all proceeds will be donated to a charitable organization. In a combination of Western and Korean traditions, a Christmas tree with traditional mulberry dolls depicting season customs is on display also. Underneath the two-meter tall trees these lovely dolls show how Koreans traditionally spent their holidays. Out of artist Kim Young-woo's entire collection of 30 dolls, approximately 20 creations are on display showing kite flying, a family on a New Year's outing, and a newly wed couple among other scenes.